A couple of months back, we reviewed Just Mobile‘s Gum Max™ iPhone / iPad Backup Battery Pack and gave it our highest recommendation for any iOS device owner. 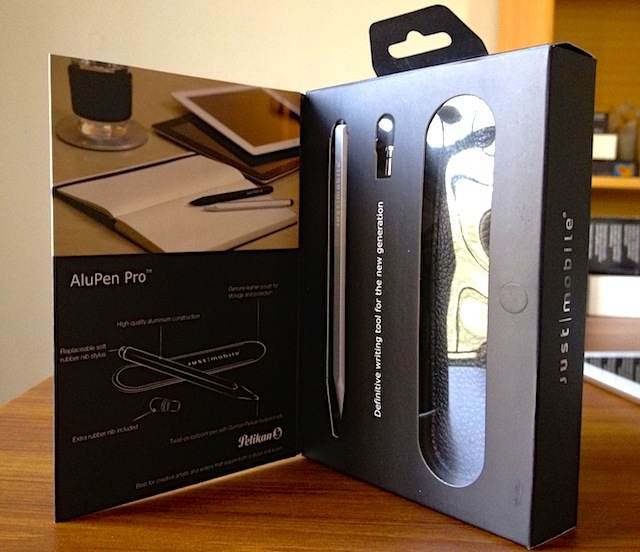 Today, we’ll be looking at another simple, yet innovative accessory from the same company which is called the AluPen Pro™, an upgrade from the original chunky AluPen™ stylus which has now been transformed into a much sleeker package. Even though I’ve always believed that iOS devices were designed to eliminate the stylus in the first place but tell you what, playing with the AluPen Pro™ has kind of changed my mind. 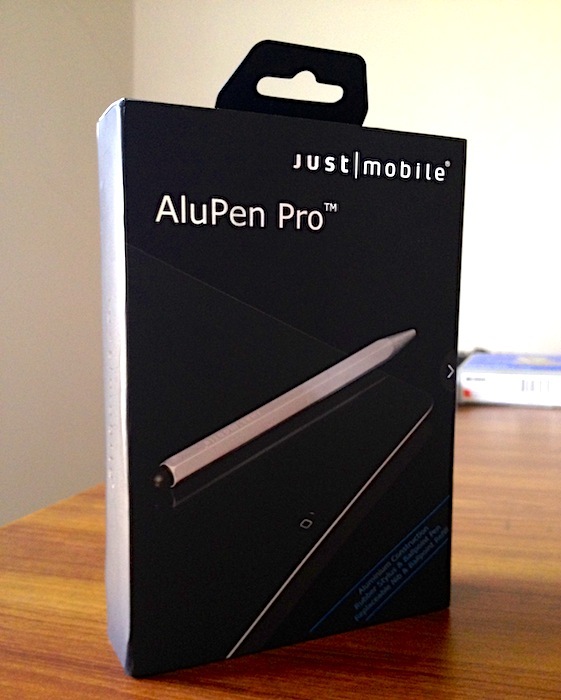 Read on for more..
Like every Just Mobile accessory, the AluPen Pro™ comes nicely packed in a decent black colored box. 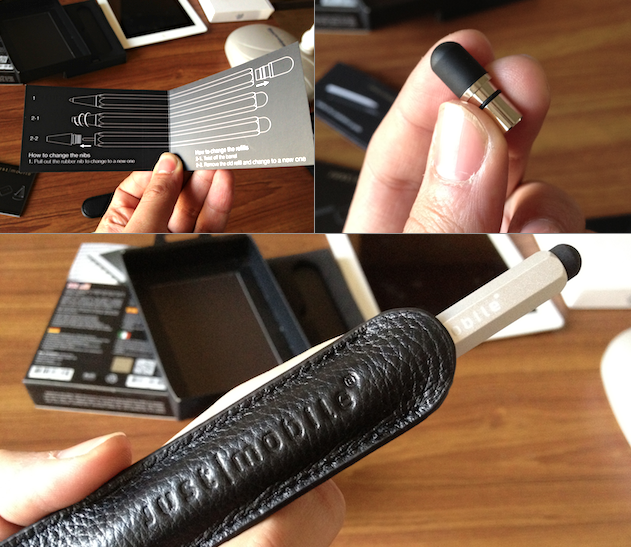 Opening it up reveals a hexagonal pencil-shaped aluminum stylus, an extra rubber stylus tip, a leather carry case and a couple of instruction booklets with two Just Mobile stickers. The stylus itself is constructed with high grade aluminum, shaped much like a regular ball point pen and measures just over 5 inches. At one end, there is a black capacitative rubber nib which works like a stylus for any iPad, iPhone, iPod touch or just about every other capacitive touchscreen device. The tapered end of the stylus hosts a retractable ballpoint pen with twist mechanism, equipped with high-quality Pelikan refill. I have used the famous Pogo Sketch stylus in the past and was mostly disappointed due to the fact that it actually scratched my iPad’s screen, literally. When I would use it gently, it would miss the strokes and when I pressed it just a little harder, it left it’s eternal mark. But with the AluPen Pro™’s soft rubber tip, it’s like a whole new world. Not even once have I noticed any missing strokes while writing, scrolling, navigating through the OS and even playing games. Best of all, it wouldn’t ever scratch your touchscreen no matter how hard you press it. I’ve been using it on my iPad fearless (from scratching it) for the last couple of days, without even a screen protector on it. Finally, AluPen Pro™’s round capacitive tip is both precise and sensitive enough for casual writing or detailed artistic drawing. Writing aside, I actually love playing Fruit Ninja with it too (watch the video demo at the end). All in all, AluPen Pro™’ is a handy accessory especially for large screen tablets and when it comes to finding a great looking multi-pen capacitive touchscreen stylus, it doesn’t get much better than this.